Don't you just love the feel of different textures? I do and best of all, is to try and capture that feeling on a photo. Similarly, the visual impact of patterns can also stimulate your senses. The Definition of Texture: Fine Arts. the characteristic visual and tactile quality of the surface of a work of art resulting from the way in which the materials are used. the imitation of the tactile quality of represented objects. 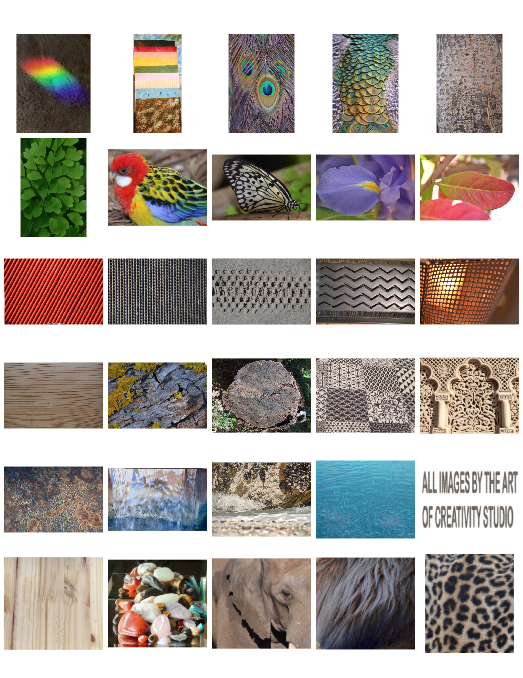 Look at the world around you and you will find texture and patterns everywhere from marble, wood (images 5, 16, 17, 18 & 26), leaves (images 6 & 10), metal, water, paint, feathers, fur, hair, skin, bricks, books, fabric, rope, rust (image 21), gemstones (image 27), rocks (image 23), sand (image 13), to even creating your own textures and patterns on canvas (image 2). I recently accompanied my husband to a Car Museum, which truth be told, I thought was going to be rather boring....However, as I was armed with my trusty Nikon D3100, I made the most of the occasion and starting zooming up close to capture the details of the textures, colours, patterns and reflections I could see on all the Vintage Cars as seen in Images 11, 12, 14 & 15. Everyone's skin is so diverse from wrinkles, freckles, white, black, young, old with the result you can create amazing texture images. Animal hide (image 28), fur (images 29 & 30), birds feathers (images 3, 4 & 7) all lend to capturing a different texture image every time. I am fortunate enough to live very close to the ocean and often go there when I am stressed. I love to watch the ebb and flow of the tide and take my dog for walks along the waters edge. Water is ever changing and has it's own textures and colours, as seen in Images, 22, 23 & 24. Try being creative and use different textures as backgrounds in your word art (image 25), artwork, paper crafts, card making and as a mock-up for work you're wanting to display or for layering in Photoshop, the possibilities are endless. Get up close, use the Macro setting on your camera, look for contrasts, try different filters, crop it, flip it, change the opacity and zoom in/out of focus. Go on what are you waiting for? You know you want to grab your camera and and let your creative self have fun.